Listen, we’ve been really lucky with action movies this year. We’ve had The Dark Knight, Iron Man, Cloverfield, just to name a few. We’ve been given quite a few intelligent, heart-pounding action films, when normally we have to put up with another Fantastic Four movie. However, there has been something missing this year. It’s blood. I’ve seen no blood this year. In fact, I haven’t seen blood in a big movie for a couple of years. Think about it. Transformers, Pirates, even Die Hard. There was no blood in Die Hard 4. That’s like having no magic in Harry Potter. So I could barely hold my excitement for Wanted, a film that promised a lot of blood. In fact, Wanted promised a lot, and for the most part, delivered. The thing is, Wanted should have been perfect. It featured the holy trinity of action films: 1. Ridiculous high-octane action scenes; 2. Angelina Jolie naked, and 3. Morgan Freeman with a gun. It was exciting, and kind-of funny, but it wasn’t great. I suppose I should describe the story of Wanted, but I would doubt anyone who is planning on seeing it really cares. They, like me, probably saw Jolie straddling the hood of a car with a machine gun and were all-but lining up at the cinema on opening night. But for the sake of a traditional review, here goes. 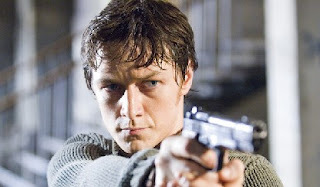 James McAvoy plays Wesley Gibson, a nervous and depressed office drone. His girlfriend is cheating on him with his best friend, his boss can make him virtually roll into a fetal ball, and even his ATM tells him what a loser he is. That is until he meets Fox (Jolie), a slinky super-assassin who informs him that the father he never knew was a trained killer. Fox and Wesley’s father belonged to The Fraternity, a secret organisation headed by the mysterious Sloan (Freeman), and developed by weavers (yes, as in textile weavers) over 1000 years ago. However, one of the member’s has gone postal, and is knocking off Fraternity members one by one, starting with Wesley’s dad. So begins the ultimate male fantasy – the insignificant Wesley is turned into a super-killer who sprints atop of trains, makes bullets curve around corners, and then totally makes-out with Jolie. And that’s pretty much it. Sure, there are a couple of twists here and there. They also attempt to explain how the Fraternity receives its hit-list (if I told you it was from a magical loom, would you say I was crazy?). But this is more than you really need to know. The film is all about action, and there is plenty of it. There is a great car chase at the start (yes, the one with Jolie on the hood), and an amazing scene set on a train as it falls down a mountain. James McAvoy steals the show with a final gunfight that is the equivalent of the Crazy 88’s fight at the end of Kill Bill 1. Unfortunately, the rest of the action falls a little flat. Normally this wouldn’t be a problem. But action is all this film has. Your enjoyment of the action scenes will depend on whether you like the style of director Timur Bekmambetov (Night Watch, Day Watch). His slow-motion, follow-the-bullet-into-the-head-of-the-victim-and-then-show-it-in-reverse effect gets tired pretty quick. Also, the whole curving bullet aspect isn’t as cool as I had hoped. After all, how can you ever feel as if the main characters life is in danger when they can literally deflect oncoming bullets with their own. Also, I’m always willing to suspend my belief in films that require it, but at one point a bullet curves in complete circle. Would the bullet ever stop? I was expecting that by the time the bullet made one full lap, the entire universe would implode due to it’s disregard of the laws of physics. But it didn’t. I suppose it would have made for a weird ending if it did. I walked into the cinema blood-thirsty, and I left feeling satiated. But not completely satisfied. Blood is nice, but I’d prefer a little bit more excitement. The film is imaginative, well-made and very violent. But ultimately, it didn’t make my heart race. However, Wanted is pushed slightly over the line thanks to a couple of scenes that were really awesome. In fact, since the story is irrelevant, maybe the DVD could come with a 20-minute ultimate edition. All it needs is the car chase, the train crash and the final shootout and I’d be happy. 25-year-old account manager Wes (James McAvoy) was the most pathetic, cube-dwelling hypochondriac the planet had ever known. Until he became Wanted. Kristen Stewart to star in Wanted 2?